To download a brief CV click here. Click here to watch my recent presentation ‘Using mercury to link Large Igneous Province volcanism to environmental perturbations‘ at the Geological Society 2018 Lyell meeting. Click here to listen to me on The Infinite Monkey Cage with Brian Cox, Robin Ince, comedian Jo Brand and Clive Oppenheimer on BBC Radio 4. Click here to listen to my ‘Life Scientific’ with Jim Al-Khalili on BBC Radio 4. Click here to watch a short video about my research and teaching. Click here to watch a BBC audio slideshow about some of our work. Click here to watch a short film about the 2011 Soapbox Science event that I was part of. We are always interested in recruiting graduate students in volcanology. The main applications round is usually in the autumn, with many university scholarship deadlines in early January. See the Graduate Admissions page for details, or email me directly. If you have any problems with journal access or getting the links to work then please email me for reprints of any of my publications (Tamsin.Mather (at) earth.ox.ac.uk). 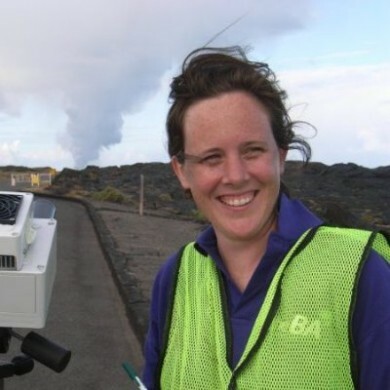 Remote-sensing of volcanoes and volcanic processes: integrating observation and modelling. D.M. Pyle, T.A. Mather and J. Biggs (eds). Geological Society Special Publication 380, 2013. S. Self, L.S. Glaze, A. Schmidt and T.A. Mather, Volatile release from flood basalt eruptions: understanding the potential environmental effects. In Volcanism and Global Environmental Change (Edited by A. Schmidt, K. Fristad and L.T. Elkins-Tanton), Cambridge University Press, 164-176, 2015. T.A. Mather and D.M. Pyle, Volcanic emissions: short-term perturbations, long-term consequences and global environmental change. In Volcanism and Global Environmental Change (Edited by A. Schmidt, K. Fristad and L.T. Elkins-Tanton), Cambridge University Press, 208-227, 2015. M.M. Parks, J. Biggs, T.A. Mather, D.M. Pyle, F. Amelung, M.L. Monsalve and L Narváez Medina, Co-eruptive subsidence at Galeras identified during an InSAR survey of Colombian volcanoes (2006-2009), Journal of Volcanology and Geothermal Research, 202, 228-240, 2011. (doi:10.1016/j.jvolgeores.2011.02.007). T.A. Mather, D.M. Pyle and C. Oppenheimer, Tropospheric Volcanic Aerosol, in Volcanism and the Earth’s Atmosphere, Geophysical Monograph 139, A. Robock and C. Oppenheimer eds., Am. Geophys. Union, Washington, D.C. 189-212, 2003. Tsanev, V.I. and Mather, T.A., 2007. Microtops Inverse: Software package for retrieving aerosol columnar size distributions using Microtops II data. Available (plus the downloadable .exe codes) from http://fsf.nerc.ac.uk/resources/software/MicrotopsInverse.shtml. Building Bridges: Science meets Parliament, Johnian News, Issue 20, November 2006, p.5. POSTnote (parliamentary briefing), Carbon capture and storage, March 2005. Tamsin Mather, A volcanic breath of life?, Chemistry World, 1(12), 30-34, December 2004. Plumbing the depths, The Economist, April 24th 2004, p. 95. Winters of discontent, The Economist, April 17th 2004, p. 87.